in digital form. Please click the link/s below for details. The nine chapters in this book explore educational and economic change in the countries of Eastern Europe and the former Soviet Union. Together they provide both an overview of the developments - in their historical context - and an analysis of aspects of the situation in a number of different countries: the former Soviet Union, Poland, Hungary, Czechoslovakia, Romania (including Transylvania) and the new Germany. The chapters not only demonstrate the immensity of the tasks facing educational development in these countries but also the extraordinary optimism and idealism of those charged with implementing change. This book incorporates the papers given at a series of seminars held in Oxford in the summer of 1991 under the auspices of the Centre for Comparative Studies in Education and the Institute of Russian, Soviet and East European Studies. 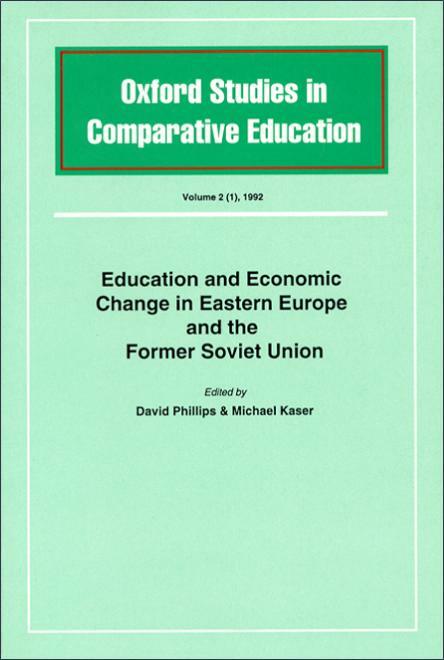 The nine papers explore educational and economic change in the countries of Eastern Europe and the former Soviet Union, and together they provide both an overview of developments in their historical context and an up-to-date analysis of aspects of the current situation in a number of individual countries - the former Soviet Union, Poland, Hungary, Czechoslovakia, Romania (including Transylvania), and the new Germany. When it comes to reforming education systems the imperatives of tradition provide on the one hand a stimulus for change, an indicator of the kind of forces that might have to be countered, and on the other a set of arguments supporting the strongest opposition to any attempts at reform. In the countries of Eastern Europe now involved, following the events of 1989, in reshaping their educational provision at all levels, there is a pronounced tendency to look back positively to the system that had existed before the communists came to power and enforced change. That the type of provision in question has often been rejected by nations in Western Europe seems not to be a major consideration in the calculations of those proposing reform - or if it is, the perceived state of education in those Western countries (Britain among them) is worrying enough to cast doubt on the wisdom of abandoning older, more traditional, styles of educational provision. A Westerner looking at the Polish school would probably notice that it is very traditional. Assuming a negative attitude towards tradition, we could say that the Polish school is old-fashioned, because it maintains a non-modern order and discipline, distance between the teacher and the pupil, a formal classroom and lesson system, and learning by heart. Taking a positive stand on tradition, we could say that the Polish school has managed to preserve the cult of solid education understood chiefly as a body of knowledge and has tried to educate its pupils accordingly. It remains an open question, in Janowski’s view, as to whether Polish schools will be perceived as having benefited from not moving, as their counterparts in Britain and the United States have done, towards a more child-centred approach to learning. The role of tradition, again, can be either a stimulus for or a block to reform endeavours. Many eastern European politicians hold nostalgically to a glorified view of the ‘old Austrian Gymnasium’ as the guarantor of a ‘classical humanistic education’. They regard the structure of their unified systems of comprehensive compulsory education as ‘Stalinist’ relics, to be removed. Unaware that during the past decades most western European countries have reorganised their school systems along comprehensive lines, they see the re-establishment of the selective Gymnasium for the 10 to 18 age range as the ‘non-communist bourgeois alternative’ to their educational status quo. Gruber sees a certain irony in the attraction a country with arguably the most conservative education system in Europe has for politicians and educationists seeking models for reform. Austria, he points out, finally abandoned its experiments with comprehensive schools in 1982. In the former German Democratic Republic (GDR) - now the eastern Länder of the Federal Republic of Germany - the model of West German provision in education became the starting point for reform of the GDR system. Despite the possibilities within a federal structure for each of the five new Länder to develop types of provision which could depart from West German norms (and perhaps capitalise on the residual strengths of the system in the old GDR), the new state parliaments have played safe by opting for versions of the traditional patterns in existence in the eleven Länder of the old Federal Republic. Those patterns had themselves, by a curious irony, been reintroduced in the Western Länder after the Second World War, when the Germans eschewed all pressure to adopt the models of the Western Allies and took refuge in the familiar system in operation during the Weimar Republic. The Eastern Germans, in common with other nations of Eastern Europe, are anxious to rediscover their historical/cultural identity and to celebrate a return to democracy; the same is true, as Wolfgang Mitter points out, for other countries of the former socialist bloc. The fact that a golden democratic past did not everywhere exist - Mitter makes an exception of Czechoslovakia - tends to be forgotten in the enthusiasm for ‘overcoming the socialist past’. The forces of tradition are indeed manifest in much of what is planned for in the countries with which this volume is concerned. Mitter reminds us that vast areas of Eastern Europe share elements of a common educational heritage which can be traced back to the reforms of Maria Theresa and Joseph II. Visitors to a Hungarian gimnázium, for example, long before the events of 1989, would immediately recognise an ethos common to the Gymnasien of Germany and Austria. Oskar Anweiler, in his paper on the historical background to current change, describes the re-emergence of long-standing ethnic questions in education - a subject addressed with great passion by András Bodor in connection with Transylvania - and the educational role of religion, particularly in Poland, where the Roman Catholic church played an important part generally in the opposition to the communist authorities; and he also describes the present interest in those notions of progressive education exemplified in the Reformpädagogik movement of the early decades of the century. The need to ‘overcome the socialist past’ has encouraged the re-opening of old debates and a nostalgic reappraisal of the pre-communist era. There were, however, several urgent developments - not in themselves determined by retrospection - which became immediately necessary once the old regimes had crumbled. Wolfgang Mitter mentions the removal of all ‘indoctrinating pressure’ and the need to start on the reform of syllabuses and the restructuring of the control mechanisms in education at all levels. Institutions have been closed, their staffs dismissed or redeployed; specifically Marxist-Leninist subjects have been removed from the curricula of schools and universities, other subjects susceptible to ideological bias (such as history or education) have been hastily purged; new teaching materials have been hurriedly cobbled together (often using outmoded Western textbooks); qualifications have had to be reassessed. Demands long called or hoped for by the participants in all stages of education have now had to be accommodated - Oskar Anweiler quotes those made by the education section of Solidarnosc as long ago as November 1980, which included individual school autonomy, self-government in school affairs, the right to set up independent experimental schools, the establishment of new curricula, freedom of instruction for teachers, and the creation of a national commission on education. The desire to accommodate such demands in systems hitherto controlled by an unbending and inert bureaucracy has created problems of huge complexity for those struggling to maintain an education system in need of urgent structural reform at a time of enormous economic instability. The scale of the problems involved is described very graphically in Andrzej Janowski’s paper. Professor Janowski found himself suddenly propelled from an academic career to the post of Deputy Minister of Education in Poland. Learning on the job has been a feature of his involvement and that of his colleagues charged with the tasks of reconstruction, and he does not disguise the difficulties of the undertaking or the mistakes that have been made, but what his paper reveals above all is the immense undertaking since 1989, involving the rethinking of all levels of educational provision by enthusiastic innovators and the countering of an opposition rooted in the premises of the old system. In the latter connection it is sad that he feels it necessary to report a tendency in some quarters to “use freedom to provoke anarchy and chaos”. “Regrettably few”, he writes, “can see the relationship between freedom and responsibility”. The nationalist, an din some cases neo-Nazi, tendencies among some groups in other countries of Eastern Europe - and noticeably in the eastern Länder of Germany - are the most tragic outcome of a new-found freedom of expression taking precedence over reasoned civic responsibility. The Solidarnosc checklist of 1982 had called for individual school autonomy, and such autonomy was also a feature of the important new Hungarian Education Act of 1985, promulgated long before the events of 1989. Institutional autonomy figures prominently, as may be seen from the contributions of Vlastimil Parízek and Ana Maria Sandi, in reform discussions in Czechoslovakia and Romania. The desire to achieve the kind of independence that the notion of autonomy suggests is of course perfectly understandable in systems which have for so long been subjected to the rigid bureaucratic and ideological control of a largely hated state and party machinery. But from a comparative perspective it is interesting to note this faith in the efficacy of institutional autonomy at a time of change. There must indeed be real fears that such autonomy, coupled with a general tendency to move towards decentralisation, will actually inhibit reform; it might be argued, uncomfortably, that reform had been slow in England and Wales before the radical changes of the late 1980s introduced by a determined government with strong interventionist inclinations, precisely because the traditional autonomy of institutions had been so jealously guarded for so long. Péter Szebenyi writes of what he perceived to be a curious convergence between the way educational policy is developing in Hungary on the one hand and England and Wales on the other, and there must now be the possibility that each country will continue in opposite directions along an autonomy:control axis, until they become demonstrably divergent again. As Anders Åslund shows in his paper, there are two paths along which reforms in education and in the economy interact. The transition from central allocations to a market system on the one hand promotes payment for services previously furnished free (on a criterion of merit or privilege), but on the other hand requires support from education in the fostering of initiative and in the techniques appropriate to the profitable operation of a business. Åslund sketches four features of the commercialisation of education. Illicit or informal payments for teaching have become open and charged not only by individuals but by institutions as their sources of public finance shrink. Secondly, institutions which do not respond to new requirements for teaching and research are being closed because governments seeking to end monetary disequilibrium become much more selective in public outlay. Thirdly, property rights which had effectively disappeared into an all-embracing (and therefore undistinguishing) state were being differentiated and private profit drawn from their exploitation. In the former USSR, Åslund quotes Leonid Grigoriev on ‘hidden’ proprietors as emerging to exercise entrepreneurial initiative whether or not ownership has been legally purchased. “Soviet citizens” he observes, “are surprisingly used to the idea of paying for education”. Finally, systemic change requires productive enterprises to be profitable and the provision they previously made (for example of vocational training) is withdrawn as no longer acceptable as a cost of production. In the support that education is now called upon to give to the process of marketisation, the experience of the former USSR, as explained by Åslund, is typical of all the economies in transition: “who wants to learn how to run a command economy, when the declared policy is to abolish an economic system?” he rhetorically asks. Western mainstream economics, management studies and applied economic research are ineluctably replacing the ideological formalisms of the past. The changes in education taking place in all the countries in systemic transformation are of both content and funding - what and how people are taught and how those lessons are paid for. There is less need for its quantity to be changed, either up or down. This is so because in all the countries concerned the communist party governments had made primary and secondary education accessible to all. The paradox is that so broad a provision of education, corresponding (in its age coverage and outreach to the remotest families) to current facilities in Western Europe, has not seemingly contributed to a closer equalisation of income per head. Freshly-compiled data for gross national product and the revision of earlier estimates in the light of newly available statistics permit the disparity in European levels to be more accurately plotted. Thus anyone travelling from Switzerland to Albania - a trip of 700 miles, which is short for Europe - moves from a country with nearly $30,000 per head national income to one with only $400. A factor of over 70 times separates the richest from the poorest in the Continent. Within the former Soviet Union the spread among the now independent Republics is of one to three. A final comparison among the countries which have thrown off communism: journeying the 240 miles which separate Slovenia from Albania brings a 13-fold drop in income per head. The European Community - which is still the Western and Southern European Community - has set itself the target of ‘cohesion’, bringing together and upward levels of living among the member states. The figures on GNP per capita show how much more daunting is the task of pan-European cohesion made possible by the collapse of the Iron Curtain, of Comecon and of the Warsaw Pact. ‘Cohesion’ with the newly-liberated peoples of Europe is on the agenda because they seek full membership of an enlarged European Community. With divergence so wide in levels of income the economist looks to endowments as a first possible cause. Yet this reveals another paradox: East Europe, in its wider sense including Ukraine, is better endowed with natural resources (agricultural land, energy and ores) than is the West. While their reproducible assets in the form of productive capital stock are lower in keeping with their income, the ratio of capital to output is about the same as in the UK. The reference is to productive capital: in mining, manufacturing, farming and transport. The communist countries achieved their parity by skimping on environmental protection and on social infrastructure, including such material facilities as school buildings. The consequences of that priority for material production have been revealed by statistics of pollution and industrial disease. The Polish Black Country and the north of Czechoslovakia record some of the Continent’s worst infantile mortality and Russia in the 1970s was the sole industrialised economy where life expectancy actually fell. Neglect of safety parameters in the nuclear industry was tragically demonstrated at Chelyabinsk in 1957, at Chernobyl in 1986 and near St Petersburg at Sosnovy Bor in 1992. The attribution of high shares of production, investment and technology to military uses abstracted proportionately more than in the West from civilian consumption and investment. The factor of production on which education operates is human resources and their deployment. Communist political isolation precluded both emigration and immigration (with the sole exception of Yugoslav Gastarbeiter mainly in West Germany). The ten million demographic increment in the twenty years of peak East European industrialisation from the mid 1950s could all be used to staff the new factories and mines. With seven million peasants transferred out of agriculture there was an influx into the priority non-farm sectors of 17 million. Collectivisation in the 1960s (except in Poland which never abandoned private farming) was less brutal than Stalin’s in the USSR of the 1930s, but effected the same industrialisation of the workforce. The demographic expansion has now been spent - in the East as in the West - and quality, mainly provided through education, became crucial. In examining the differentiation of East from West Europe the wide spread of income is not matched by primary and secondary schooling. Enrolments embrace the entire population of compulsory school age and the population of working age is literate. Technical education has been sufficiently long established for there to have been on the eve of the 1989 revolutions in the four most developed states, the GDR, Czechoslovakia, Hungary and Poland, 2.8 million higher education graduates in employment or nine per cent of the total employed (of 29.7 million). The conclusion can be drawn that at the medium to high levels of income already reached, it is the quality of education that is relevant to material growth. Much, though far from all of that quality derives from higher education, the institutions of which provide teachers for the entire system from primary to tertiary, and supply much, but of course not all, of the technical expertise of the economy. In addition it is in higher education that the new motivations to run a market economy can be fostered, although here again, education is but a part of the restructuring of attitudes that the transformation of the system needs. A symposium on Soviet education under the perestroika of 1985-91 (comprising revised papers presents to the Fourth World Congress for Soviet and East European Studies in Harrogate, July 1990)  demonstrates one of the policy shortcomings which vitiated the quality of higher education - its isolation from scientific research. Writing in 1990 a soviet author states that science departments in universities were equipped at only a fifth of that in research institutes and renewed at a rate of a mere 1.5 to 2 per cent a year. Another page, criticising the past Soviet practice of educational reform ‘promulgated from above’, looks to educational change as the economy moves towards a market “to recognise the importance of individual incentives, academic market mechanisms and the legitimacy of individual choices”. Taken together, the Harrogate papers and those in this volume of Oxford Studies in Comparative Education series demonstrate the immensity of the tasks facing educational development in the countries of Eastern Europe and the former USSR. They show too the extraordinary optimism and idealism of those charged with implementing change. Educational change in any circumstances is a highly complex and difficult matter; reform in the economic climate affecting Eastern Europe, and in the context of the development, from scratch, of market economies in which privatisation and general entrepreneurship are encouraged, is a daunting prospect indeed. It is, as Wolfgang Mitter points out, too early to judge what the outcome of present developments will be; we hope, however, to be able to return in future studies to the issues addressed in this collection, and to provide a further evaluation of the considerable progress now so firmly under way in countries experiencing the first flush of educational freedom in many long decades. Karl Heinz Gruber (1991) No model for democracy, The Times Educational Supplement, 22 March. John Dunstan (Ed.) (1992) Soviet Education under Perestroika. London: Routledge. Cited by Harley D. Balzer (1992) Educating scientific revolutionaries? Continuing efforts to restructure Soviet higher education, ibid., p. 172. Stephen T. Kerr (1992) Debate and controversy in Soviet higher education reform: reinventing a system, ibid., pp. 160-1.